In water-based inkjet inks there is presence of volatile organic compounds (VOC) and they do have low level of toxicity, the dry rate is relatively slow on the non-absorbent substrates. They often require a special coated media for optimizing dot gain and drying. They also need lamination to secure water resistance. Originally they were developed for the desktop systems only but moved on to facilitate the growth of inkjet in wide-format graphics. Pigments give environmental friendly products along with durability and better compatibility with packaging. However one thing needs to be specified here is that the colloidal properties generally associated with pigments are more complex than dyes. Inorganic pigments that are used for making printing inks are Carbon Black (very important), Titanium Oxide, Molybdenum Red Pigments and iron Blue all with medium usages while Chromate Pigments (sparingly used). To make the white inks, the most important inorganic pigment is Titanium dioxide. Another popular inorganic pigment, calcium carbonate is used as an extender to make white inks. But, if we want to make black ink, then the most randomly used inorganic pigment is carbon black. Now a days, the inorganic colored pigments are very rarely used because, these pigments contain very high degree of metallic toxics like chromium, cadmium and lead. 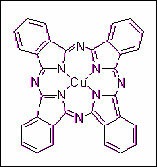 In their place to create green and blue shades, phtalocyanine pigments are used. For red and yellow shades inks, Azo pigments are very preferred medium. Whether the molecules of the pigments will absorb light in the visible range or not, depends upon the presence of the conjugated system of double bonds in these molecules. Less susceptibility to environmental factors and oxidising gases. Particles that are found in a dried pigment ink has a surface that is very rough. 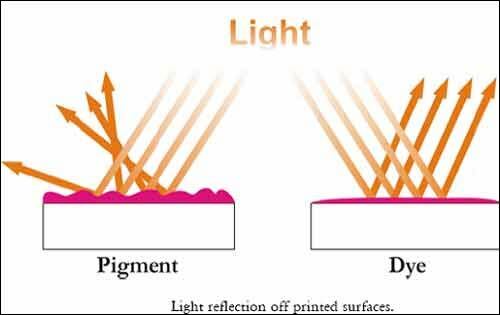 As a result the light that is reflected of the prints has a predominant tendency toward scattering, giving rise to color that is less saturated and dull. 100% of water-fastness on any type of media. Excellent color hue and quality for that perfect imaging effect. Excellent light and weather fastness. Particle size below the level of 0.08 micron.